Feeling that the photos shown below the post describing the first use and making of glass floats in America, were too small, I decided to take some photos from the book, HOUSE MISCELLANEOUS DOCUMENTS 1st. Session, 48th. Congress 1883-'84 vol.33, REPORT OF THE COMMISSIONER OF FISH AND FISHERIES 1884. 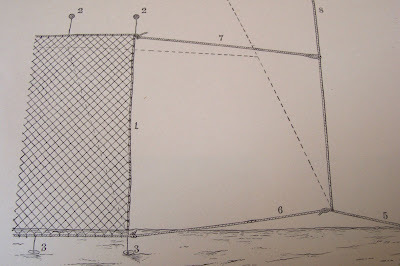 Perhaps the readers of this blog will appreciate seeing in more detail, the construction and use of the nets. 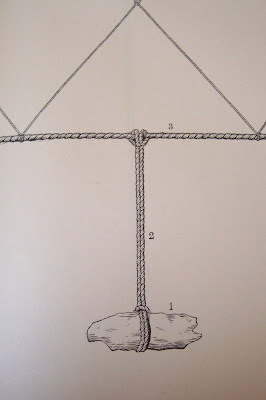 The top photo shows the method for checking the nets for fish. The method is called "Underrunning." "Fish are caught only at night, and, consequently, the nets are underrun only in the morning, unless the men are detained by unfavorable weather until later in the day. In underrunning, the fisherman goes to one of the buoys on the end of his gang of nets, takes it in the dory, and hauls away on the buoy line, the buoy being thrown out on the other side, and the line allowed to run out on one side as fast as it is hauled in on the other. When the anchor line (or underrunning line, as it is sometimes called)is up, it is taken across the dory, and the fisherman hauls along towards the net. 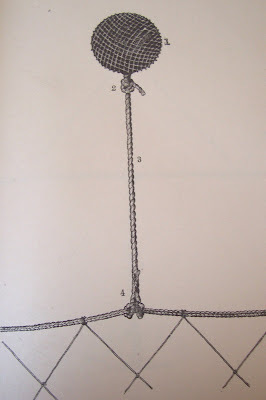 The gear is underrun by pulling the nets in on one side of the dory, and, as fast as the fish are removed, allowing the apparatus to pass over the other side into the water; the anchors, which remain firmly fixed in the bottom, holding the nets in position until the work is accomplished. 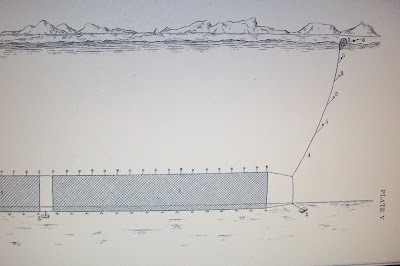 When the end of the gang is reached, it is thrown off the dory, and the nets remain setting as before, needing no further attention until the next day. 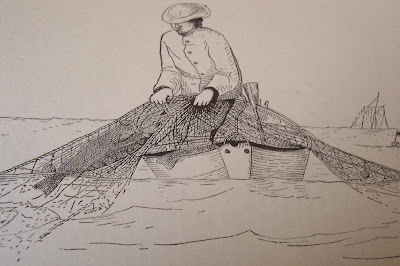 As will be readily understood, this method of fishing can be carried on with the minimum of labor; and it also has this additional advantage, namely, while the gear is still out, the vessel may take her morning's catch to market, or, if the weather is threatening, she may remain quietly at anchor overnight in the nearest harbor, though in the meantime her nets are fishing." a fast shout out and say I truly enjoy reading your posts. Can the customer suggest a professional blogs/websites/forums that deal with broadly the same topics? an A+ with regard to effort and hard work. all the facts. You know, they say, details make or break the argument. you've any? Please let me realize so that I may just subscribe. first on the facts. As they say, the devil is in the details. the actual final result. For right now I will subscribe to your position but hope in the future you connect the dots much better. like that. Can I take a fragment of your post to my site? Definitely, what a great website and illuminating posts, I surely will bookmark your site. that is written on your website.Keep the posts coming. I liked it! them and have now without a doubt been loving them. The clarity in your post is simply spectacular and I can assume you are an expert on this field. Well with your permission allow me to grab your rises feed to keep up to date with incoming post. Another tip would be to remember what you are buying. Quite simply investors often forget that when buying a stock they are simply buying ownership in the companies. In the year 2000, sitting in front of our new computer keyboard and screen, it took me about an hour before I found the Ebay glass fishing float auction site. My life has been filled with constant float excitement ever since. While I do have a representative collection of beautiful Japanese and other Asian floats, it is the European and American floats that I love collecting the most. Walt Pich, Woody Woodward, Amos Wood, among others, have done much to reveal the character and history of the Asian floats. Now, there are a number of people involved in revealing European floats and their history. This blog is an attempt to bring together the talents, thoughts, knowledge and collections of glass float lovers. It is my fondest hope, that we can all have some fun here, and share our passion and knowledge for glass fishing floats. I heartily welcome photos and communication, which I will post to the blog. Just email me at: trizzo8037@comcast.net with anything that you would like to share about your collections, personal history or knowledge of floats.